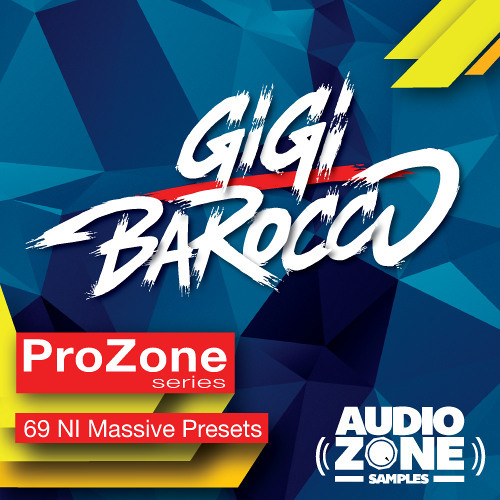 Audiozone Samples is proud to announce the re-edit version of the first ProZone series’ release featured GIGI BAROCCO, the powerful italian Sound Engineer, Producer, DJ and Showman! !!! This pack contain 69 awesome NI Massive presets, great to be filled in all mainstream genres as EDM, Electro, House, Techno, Dubstep, Trap, Progressive, Drum & Bass and more. Expect to find phat Basslines and anthemic Leads, followed by atmospheric Pads and a variety of epic Drums, Voc & FX sounds, ready to drop straight into your next big tune! GIGI BAROCCO in 2013 have worked with a real milestone of international music scene, Sir. Paul McCartney, mixing his amazing collaboration with The Bloody Beetroots. In his career he remixed for label like Ultra Records, Universal USA, Interscope, Ministry of Sound Australia, Dim Mak and Zooland, various of his remix has big chart success like LMFAO “Sorry for party rocking”, Benny Benassi ft. Gary Go “Control”, The Bloody Beetroots ft. Tommy Lee "Raw”, Steve Aoki ft. Zuper Blahq aka Will.i.am “I’m In the House”, P!nk “Blow me (one last kiss)”, Kid Cudi & Dan Black “Symphonies”, The Only “F**kin Rave Party”, Mustard Pimp “Kiwi”, Spencer & Hill “Trespasser” and Redman “I Hold The Crown”. ProZone series feat. Gigi Barocco really has everything you need to create your own floor rocking track!!! PLEASE NOTE: if you own the previous version of “AS003 / ProZone series ft. Gigi Barocco”, contact Audiozone Samples on Facebook providing an email where you will receive the FREE UPDATED VERSION. WHAT’S INSIDE THE PACK??? • 27 = Bass • 23 = Lead • 08 = Pad • 04 = Drum • 04 = FX • 03 = Voc Audiozone Samples, the Future Sound of Tomorrow!